Choose the FRONTpart that meets the design and expiration time-frame you want. Choose the BACKpart style that has the same expiration time-frame as the FRONTpart. Simply adhere the two parts together to begin the pre-determined expiration process. There is no need to collect used badge as red lines will indicate the end of an approved visit. Choose These When Printing Badge With A Direct Thermal Printer. Choose These When You Want The Badge To Adhere To Clothing Without Using A Strap Clip. TIMEbadge Clip-On BACKpart With Printed Color Header. Choose These When You Want Colored Headers Pre-Printed With Visitor, Vendor, Temporary or Contractor. Choose These When You Want Plain Colored Headers To Allow You To Color Code Your Visitors. Available in Yellow, Red, Reflex Blue, Pantone Green, Process Blue, Purple and White. TIMEbadge Adhesive BACKpart - Half-Day/One-Day - 500/Pkg. Item#06032 - The TIMEbadge Adhesive Half Day / One Day BACKpart works with all two-part Half Day or One Day TIMEbadge Expiring FRONTpart badges (sold separately). Simply place FRONTpart over BACKpart and the expiration process begins. - 500/Pkg. Please Note: Adhesive badges should not be applied to delicate materials such as leather, silk, suede and vinyl. TIMEbadge Clip-on BACKpart With Printed Red "Visitor" Header - Half-Day/One-Day - 500/Pkg. Item#05913 - The TIMEbadge Clip-On Half Day/One Day BACKpart with Red "Visitor" Header works with all two-part Half Day or One Day TIMEbadge Expiring FRONTpart badges (sold separately). Simply place FRONTpart over BACKpart and the expiration process begins. These 3" x 3" badges come fan-folded. - 500/Pkg. 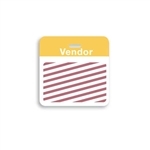 TIMEbadge Clip-on BACKpart With Printed Yellow "Vendor" Header - Half-Day/One-Day - 500/Pkg. Item#05937 - The TIMEbadge Clip-On Half Day/One Day BACKpart with Yellow "Vendor" Header works with all two-part Half Day or One Day TIMEbadge Expiring FRONTpart badges (sold separately). Simply place FRONTpart over BACKpart and the expiration process begins. These 3" x 3" badges come fan-folded. - 500/Pkg. TIMEbadge Clip-on BACKpart With Printed Blue "Temporary" Header - Half-Day/One-Day - 500/Pkg. Item#05938 - The TIMEbadge Clip-On Half Day/One Day BACKpart with Blue "Temporary" Header works with all two-part Half Day or One Day TIMEbadge Expiring FRONTpart badges (sold separately). Simply place FRONTpart over BACKpart and the expiration process begins. These 3" x 3" badges come fan-folded. - 500/Pkg. TIMEbadge Clip-on BACKpart With Printed Green "Contractor" Header - Half-Day/One-Day - 500/Pkg. Item#05915 - The TIMEbadge Clip-On Half Day/One Day BACKpart with Green "Contractor" Header works with all two-part Half Day or One Day TIMEbadge Expiring FRONTpart badges (sold separately). Simply place FRONTpart over BACKpart and the expiration process begins. These 3" x 3" badges come fan-folded. - 500/Pkg. TIMEbadge Clip-on BACKpart With Plain Color Header - Half-Day/One-Day - 500/Pkg. Item#0590X - The TIMEbadge Clip-On Half Day/One Day BACKpart with Plain Color Header works with all two-part Half Day or One Day TIMEbadge Expiring FRONTpart badges (sold separately). Simply place FRONTpart over BACKpart and the expiration process begins. These 3" x 3" badges come fan-folded and a Choice of Seven Colors - 500/Pkg. TIMEbadge Clip-on BACKpart With Printed Red "Visitor" Header - One-Week - 500/Pkg. Item#05953 - The TIMEbadge Clip-On One Week BACKpart with Red "Visitor" Header works with all two-part Half Day or One Day TIMEbadge Expiring FRONTpart badges (sold separately). Simply place FRONTpart over BACKpart and the expiration process begins. These 3" x 3" badges come in a roll. - 500/Pkg. TIMEbadge Adhesive BACKpart - One-Week - 500/Pkg. Item#06013 - The TIMEbadge Adhesive One Week BACKpart works with the two-part One Week TIMEbadge Expiring FRONTpart badges listed below (sold separately). Simply place FRONTpart over BACKpart and the expiration process begins. - 500/Pkg. TIMEbadge Clip-on BACKpart With White Header - One-Week/One Month - 500/Pkg. Item#06023 - The TIMEbadge Clip-On One-Week/One-Month BACKpart with White Header works with all two-part One-Week/One-Month TIMEbadge Expiring FRONTpart badges (sold separately). Simply place FRONTpart over BACKpart and the expiration process begins. These 3" x 3" badges come in a roll. - 500/Pkg. Inkjet-Printable TIMEjet Expiring One Day Badge FRONTpart-Blank-500/Pkg. Item#02015 - TIMEbadge Inkjet-Printable Expiring One Day badges visually expire with red lines gradually appearing after approximately 15 hours, indicating the end of an approved visit. They are convenient, as there is no need to collect used badges. Simply place FRONTpart over BACKpart (sold separately) and the expiration process begins. These FRONTpart badges print from any inkjet or laser printer, and come 2-up per sheet. They come blank so you can customize your own layout with text or your logo. - 500/Pkg. #05913 Clip-on BACKpart One-day "Visitor"
#05937 Clip-on BACKpart One-day "Vendor"
#05938 Clip-on BACKpart One-day "Temporary"
#05915 Clip-on BACKpart One-day "Contractor"